1.Activa Lpg Water Heater Comes With Fully Auto Matic Japnese Technolodgy. # 2. 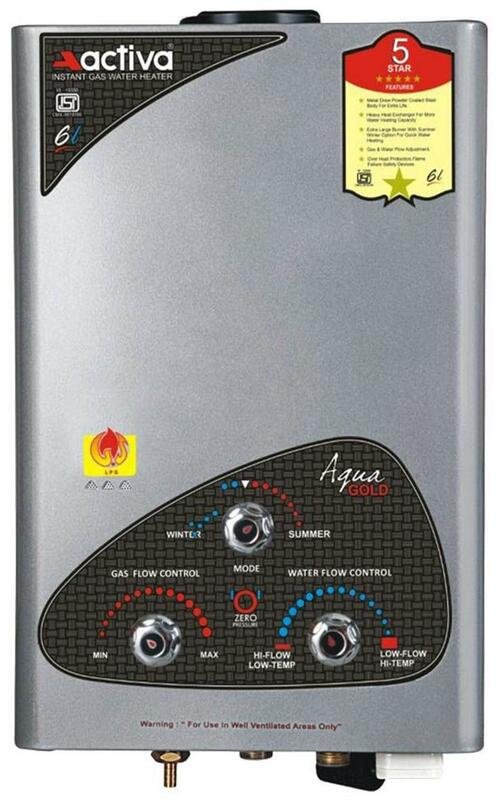 The Activa Gas Water Heater Works Instantly With Flame Failure Protection. # 3. Over Heating Safety System To Ensure Your Safety. # 4. 75% Cheaper Than Elecric Gysers And 30% More Gas Saving By Using The Best(Extra Heavy) Heat Exhanger. # 5. Battery Operated Automatic Ignition. # 6. Very Elegant,Attractive And Different Body Design With Topclass Quality And Features. # 7. Extra Large Burner With Summer Winter Options For Quick Water Heating. # 8.Gas And Water Flow Adjustment. # 9.Flame Failure Safety Device. # 10.Pure Copper Container For More Durability And Efficiency. # 11.Suitable For Both Low And High Pressure Installations # 12.The Seven Tank Processed Powder Coated Sheet Metal Body To Avoid Corrsion. # 13.Best Combination Of Silver Mettalic And Black Color To Make Your Bathroom A Unique Look 14.Self Installation. # The images represent actual product though color of the image and product may slightly differ.